Jeremy Runnells updated the CES Letter in 2017, and so, in 2018, I substantially updated my reply. It’s been hosted over at Canonizer.com as part of the new Latter-day Saint Survey Project. The new version, while not infallible, has far fewer typos, vastly improved graphics, and close to 50% new material. Below is what I originally wrote, with links to the 2016 version of my reply, if that’s still of any interest. I recommend you read the newest version if you haven’t read any of this before. Daniel Peterson is a brilliant BYU professor who spends a lot of his time engaging in LDS apologetics. 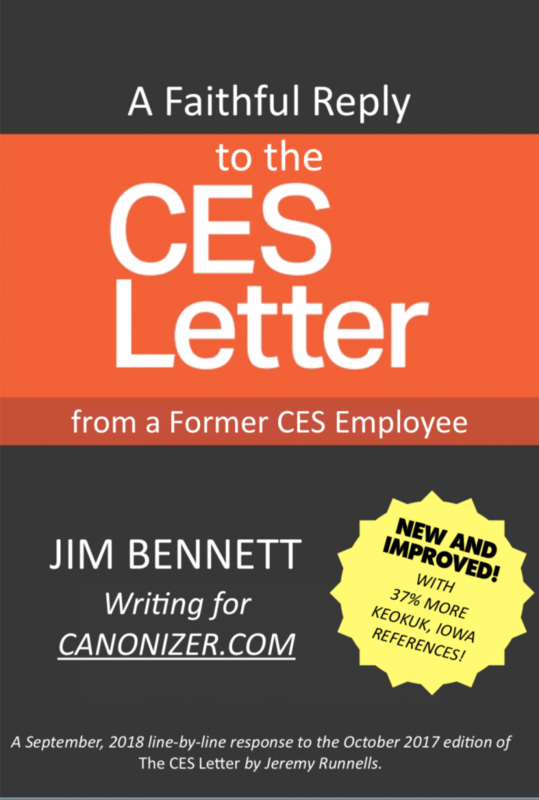 In August of 2014, Peterson gave a presentation to the apologetic group Fairmormon on the topic of a PDF booklet titled “Letter to a CES Director: Why I Lost My Testimony” by a guy named Jeremy Runnells. The following is the first paragraph from the transcript of that presentation. Some of you don’t know what the “Letter to a CES Director” is. It’s a letter that’s been circulating online for about a year now… a year and a half, I think, as far as I know, that has gotten quite a bit of circulation. It’s a kind of compendium of standard critical arguments against the truth claims of the Church. It’s entitled “Letter to a CES Director: Why I Lost My Testimony,” and it was written, as the story goes, by request of a CES director who wanted to know why this young man had decided to leave the Church. He wrote the letter. The CES director said he would get back to him with answers, but he did not, according to the story. Now the thing is about 90 pages long, and it’s just a rata-tat-tat list of objections. I can understand why a normal person confronted by that would say, “Well, you know, I’ve got a life. Its 90 pages of quick and dirty objections would take 500 pages to respond to, and probably wouldn’t do much good, so, never mind. Which proves that Dan Peterson was right about one thing – I have no life. Honestly, why would I do this? Probably because Runnells’ letter has become the new gold standard for those taking issue with the Church. Dissidents like John Dehlin and blogs like MormonThink and ZelphontheShelf (a great, great title, by the way – well done, Zelph!) frequently quote from it as the authoritative source for orthodox ex-Mormon positions. As I wander in and out of various Facebook groups and blog discussions, I become astonished at how far-reaching the influence of the CES Letter really is. While I was preparing this response, I received word that one of my cousins has lost her faith as a result of it. Indeed, so many cite Runnells’ arguments as the catalyst for their own faith crisis that it begs for a substantive and faithful reply. There have been attempts, of course, but most of them are like Daniel Peterson’s – shorter summaries rather than a line-by-line refutation. FairMormon comes closest – they have devoted considerable resources to responding to it, except the presentation is somewhat disjointed. I thought it would be helpful if someone like the CES director to whom the letter was directed had actually replied in a comprehensive conversation rather than through a piecemeal series of encyclopedia entries. I’m not a CES director, but I did teach early morning seminary for three years, which makes me a former CES employee. (Or a CES contractor, anyway.) That gave me enough chutzpah to rise up to the challenge. When I first read the CES Letter, I realized that I had already written a number of things about many of the subjects, so I started cutting and pasting responses, which deluded me into thinking I could pull this thing off without much effort. But then when I fully committed to making my way through the whole thing, I realized how naive I had been. (I even ended up having to do things like read almost all of “View of the Hebrews” by Ethan Smith. Nobody should have to read “View of the Hebrews” by Ethan Smith.) But, still, I kept slogging on until it became too late to turn back. If you really want to read the whole thing all at once, you can download the PDF and peruse it at your leisure. If you click on the button below, it will open the PDF in a new browser tab. If you right-click on it, you can choose to download it directly to your own computer. It’s essentially a book, and not a short book, so I don’t expect that everyone will want that much CES Letter in their lives in a single dose. So in the meantime, I’ve posted it in a serialized fashion on this blog so you can digest it in smaller chunks, with the first post here. The blog version differs slightly from the PDF version, as I added transitions, fixed legions of typos, and tweaked a few things to make the experience a little smoother. Also, be warned that I plagiarize heavily from myself, and you may discover large passages in my response that you’ve already read before on this blog. I make no apologies and give myself no proper attribution. So consider this post a warning. You’re going to see a lot more on this subject in the coming days. If you’re not interested, feel free to ignore me. If you are interested, also feel free to read ahead.